Ontario remains an arbitration-friendly jurisdiction, the Ontario Court of Appeal has confirmed in its recent decision in Haas v. Gunasekaram. In overturning a motion judge’s refusal to stay proceedings under s. 7(1) of the Ontario Arbitration Act, the Court emphasized that courts should enforce arbitration agreements where possible and set out an analytical framework to be used in determining whether a stay of proceedings should be granted. The facts in Haas are straightforward. Haas entered into a shareholders’ agreement with three other investors in a Toronto restaurant. The restaurant failed. Haas sued the other three parties to the shareholders’ agreement to recover his investment. Haas’s claim alleges that the defendants induced him to sign the shareholders’ agreement through fraudulent misrepresentations about the management, operations, capitalization and projected return on investment from the restaurant. The three defendants sought to stay Haas’s action under s. 7(1) of the Arbitration Act so that the dispute could proceed by way of arbitration, as provided for in the shareholders’ agreement. The motion judge refused to stay Haas’s action, determining that the “pith and substance” of most of the claims advanced by Haas related to the fraudulent misrepresentation of facts that caused Haas to enter into the shareholders’ agreement, and were not contractual claims. Accordingly, he concluded that Haas’s claims were outside the scope of the arbitration agreement. Is there an arbitration agreement? What is the subject matter of the dispute? What is the scope of the arbitration agreement? Does the dispute arguably fall within the scope of the arbitration agreement? Are there grounds on which the court should refuse to stay the action? There was no dispute between the parties that there was an arbitration agreement and that it was broad in scope. The main issue arose out of the second part of the framework – the subject matter of the dispute. Although the “pith and substance” approach used by the motion judge was not in error, the appeal court disagreed with the result. The Court held that defendants’ alleged failures were really failures of the defendants to perform their obligations under the shareholders’ agreement, and not true misrepresentations. When determining the scope of the arbitration agreement, the Court held that the motion judge erred in determining that the arbitration agreement did not extend beyond contractual claims. He erred in three ways: assuming that tort claims fell outside the scope of the arbitration agreement; assuming that a fraud claim vitiates an arbitration agreement; and failing to recognize the law’s policy of enforcing arbitration agreements and letting arbitrators decide the scope of their own authority (the so called “competence-competence” principle, which is expressly provided for in s. 17(1) of the Arbitration Act). Because these three errors fell squarely within the list of extricable errors of law referred to in Sattva Captial Corp v. Creston Moly Corp., no deference was owed to the motion judge’s interpretation of the contractual documents. The Court stressed that tort claims do not automatically fall outside the scope of an arbitration agreement and fraud claims do not automatically vitiate an arbitration agreement. The court noted that the broad arbitration agreement found in the shareholders’ agreement did not specifically exclude tort, fraud or misrepresentation claims from its scope. This decision highlights that Ontario remains an arbitration friendly jurisdiction. 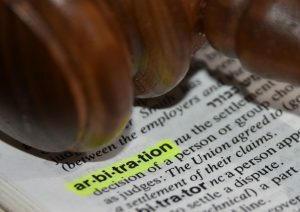 Where an arbitration agreement is broad in scope, this decision should serve as a reminder that strategic pleading of tort or fraud claims will not automatically remove a dispute from the jurisdiction of an arbitrator and a motion for a stay of proceedings will likely succeed. Parties to arbitration agreements must draft them with care and should consider explicitly excluding tort or fraud claims if that is what they intend.